So, I ventured out of the house today. I thought it was pretty brave of me, considering I still have this lingering cough and not much energy, but the need for new reading material was too great.. Anyway, the library still doesn't have ANY of the books I REALLY want to read (the rest of the Mediator series by Meg Cabot, Call of the Weird by Louis Theroux, Minus Nine to One by Jools Oliver), but I managed to pick up a couple of semi-interesting looking books (I'll let you know if they're any good) and I bought a little present for a friend of our's daughter (born exactly two weeks before Boy - a pretty little pink sleeping bag) and almost came home without looking my husband's Easter egg! Now, my husband isn't the chocolate-for-Easter type. In fact he isn't the any-kind-of-present-whatsoever-for-Easter type, but last year he ended up with a Kinder egg, and seemed pretty satisfied. At least until he opened the prize. 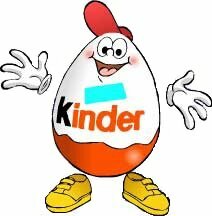 I'm looking for a larger Kinder egg, with a much snazzier prize, but no luck at my local Woolworths :( I hope I find it in time.